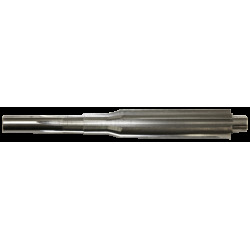 A finish reamer designed to remove the last few thousandths from a "short chambered" barrel to properly headspace the rifle. The reamer is inserted into the chamber, allowing the bolt to push on the back of the reamer. A drive rod is threaded into the reamer, inserted from the muzzle and turned from the muzzle end. Finish ream the chamber until the bolt lugs drop-in for perfect headspace. Drive Rod is about 36"